Health and fitness wearables were likely to be on many people’s lists last Christmas. This is great because it means that we are all trying to improve our health and fitness. Move more. Run faster. Sleep better. Eat more healthily. And we want to monitor how well we are doing. Widespread use of health and fitness wearables could be great for society, too, because it can counter-act large demographic trends such as population aging or the increase in chronic diseases. And, in the long term, it could halt rising healthcare costs. And, of course, it is good news for the manufacturers of health and fitness wearables because it generates revenue, and because it increases further adoption (one of the key factors influencing choice of specific wearable is seeing other people use one). And, last but by no means least, because it allows for the collection of valuable behavioural data. Good news all around, right? Yes, but … there is a (not so) small problem. All these benefits will materialise only if people continue to use their health and fitness wearables long past the Christmas season. And the evidence is that many don’t. Various commercial sources say that about half of consumers abandon their wearables within the first six months. 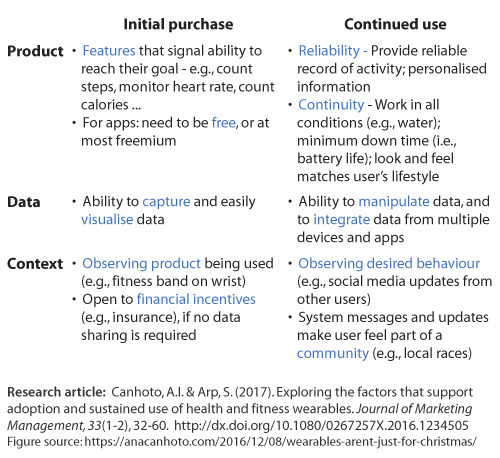 So, what is it that loyal health and fitness wearables’ users value about these products, and which factors support their sustained use? Sabrina Arp and I report, in a paper published in the Journal of Marketing Management the results of a study that explored exactly that question. This is what we found. First, we found that consumers had a very broad and ‘untidy’ definition of health and fitness wearables. They saw specific devices like fitness trackers and smartwatches as part of an eco-system, which also included a myriad of applications plus their smartphones. This is very different from the features-based, narrow definition of wearables. Second, we identified various patterns of use among consumers who defined themselves as loyal users of health and fitness products. Some users were very loyal to a particular product (e.g., their fitness band) but often decreased frequency of use, or stopped using it, for a while – e.g., in between races. Others, used wearables continuously, for various months or years but, during that period, they had tried multiple devices and applications. That is, consumers had a more nuanced understanding of sustained use than that adopted by commercial reports, which tend to focus on uninterrupted use of one product. Third, we found that the factors valued by loyal users of health and fitness wearables were quite different from those that had influenced the initial purchase of those products. The figure shows the factors identified. In summary, those factors that make a product successful to start with, and those that support loyalty, can be quite different. If we want consumers to continue using their wearables, we need to ensure that the devices and apps have both types of features, and that we reveal these, gradually. This is an edited version of material originally posted on the author’s personal blog on 8 December 2016, and is reposted here with their permission. Ana Canhoto is a Reader in Marketing at Brunel University London. Her research focuses on the role of technology in interactions between firms and their customers. Do we own our digital possessions? Increasingly the items we call our own exist in digital form. However, are they really ‘ours’? Rebecca Watkins and Janice Denegri-Knott discuss their research with Mike Molesworth, which draws from legal scholarship to recognize the complex array of ‘fragmented’ ownership configurations in the context of digital virtual goods.